The long, dimly lit, narrow room stretched out before him. 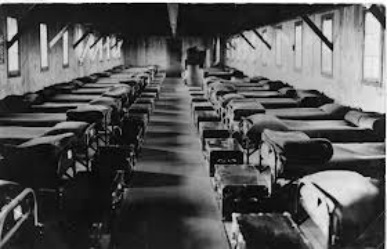 Perfectly made beds lined the walls on either side spread with plain brown blankets. The one window at the end was heavily draped with drab fabric blocking out any hope of sunshine as well as the bars on the outside. There were no pictures on the grayish walls or brightly colored decorations like he had in his room back home. He shuddered. There was no "back home" anymore. That life disappeared along with the last breaths his parents took. That world shattered with the glass from the family car as it careened down the embankment into the thick brush and beyond to the hidden drop off. He felt a nudge in the middle of his back startling him from the horrors that now plagued his thoughts so often. He took a few steps further into the cold room. "This will be your bed." The tall slender woman spoke softly to him. "You can put your clothes in here." She opened the trunk at the end of the bed, reached for the bundle he had in his arms and tugged at it. He curled his arms tighter around his few belongings. "Come on sweetheart. I know you're frightened, but this is the way it has to be. Your parents are gone and the authorities haven't found anyone to claim you. This is your home for now. We need to put your things away." She pried his small thin fingers away from the hold they had on his things. He didn't have much, but they were his. He didn't want anyone to take that away from him too. She kept at it until she worked his hands free. She gently pulled the bundle from his grasp and dropped it into the trunk. They could sort them and fold them later. The dark haired boy looked so broken and lost. "Come here sweetie." She pulled him into her embrace and held him there as silent tears slid down his face. She could feel the tremble in his thin frame. When he had cried out his anguish she helped him take off his jacket and shoes tucking them safely into his foot locker. Exhausted, he crawled into the bed and curled himself as small as he could, hugging his legs and tucking his head to his knees. The woman stood and pulled the covers over the boy. "You just rest. I'll come for you when it's time to eat." Turning from her charge she walked softly across the long room to the door and turned off the lights plunging him into the darkness that had become his world. The boy fell into an exhausted, dreamless sleep. His dreams had become nightmares. Sleep no longer an escape, so the dreamless slumber afforded him some much needed rest. Several hours later when the woman returned to wake him she found him flat on his back with his arm draped across his eyes. The threadbare sheet and thin blanket bunched around his long slender legs and his breathing still laced with sounds of a deep sleep. She knew he needed to eat, but chose not to disturb him. She would make him a sandwich for later when he woke on his own. After taking the time to disentangle him from the covers and tuck him securely into his bunk she tiptoed back to the door and pulled it to just as sad brown eyes opened to follow her as she exited the room. He heard the click of the lock on the heavy door and pulled his blanket to his chin, once again curled into a tight ball and let the tears slide down his face dampening the pillow. He hadn't done anything wrong. Why had they sent him here? Officer Brewster stood outside the heavy door for a moment after closing it contemplating her decision to leave the boy asleep when she heard a soft whimper from the speaker on the wall. The boy hadn't spoken a word since his arrival. He hadn't made a sound when he cried earlier that day, so the soft whimper though it tore at her heartstrings gave her a glimmer of hope for the child. The Sheriff had told Warden Tompkins the boy had not uttered a word since the firemen had pulled him from the wreckage that claimed his parent's lives, at least not that anyone could understand, so even a whimper seemed like music to her ears. Watching him curl back into himself on the monitor, she decided to take special care with this young boy. Something about him was extraordinary. She sensed a kindness, a gentle spirit in this child and knew that in the harsh world in which he had been thrust those qualities could be squashed to make way for bitter resentment and hate. He didn't deserve to be here in the juvenile detention center. His only crime was being half Native American and unwanted by his people. She lifted a prayer to the heavens for him before returning to the others under her watch. Left to their own devices for very long the fifteen boys ranging from eight to twelve from her block would find a way to anger Warden Tompkins and find themselves scrubbing the building spotless for weeks to come. She smiled at that thought. Warden Tompkins was good to the children especially these younger boys, but he felt hard work cleaning would help them learn to behave more appropriately. Officer Brewster knew better. She knew boys would be boys and no amount of cleaning would dampen their spirits. Miraculously, when she returned to the cafeteria what she found was a room full of hungry children with their heads bowed in prayer and Warden Tompkins standing by the door smiling. Heads raised and small hands shot out grabbing forks, napkins and buttered rolls. He shrugged, "They want to watch 'Walt Disney Presents' after dinner. I told them it depended on their behavior." "They love that show. It makes for a special Sunday night treat before returning to school tomorrow." She smiled. Officer Brewster bowed her head and closed her eyes for a second before answering her superior. "He was still sleeping." "Yes, but according to the records from the hospital he has not been sleeping well either." She said softly. "You will see that he eats later." "Yes sir. I will see that he eats." She knew she had made the right decision to leave the boy where he was. "I will make him a sandwich." "Maybe some buttered rolls with jelly." Warden Tompkins winked at juvenile corrections officer. "I always liked that when I was a boy." With that he walked away. A bustling of feet and slamming of foot lockers woke the boy sending him scrambling to the head of his bed in fear. "Hey who are you?" One of the taller boys in the beds next to his asked. He covered his ears with his hands and ducked his face to his knees. "We won't hurt ya…at least not yet." His head shot up and brown eyes darted from side to side looking for an escape. He shot off the bed and padded across the wooden floor in his socked feet stumbling with every few steps. When he righted himself with a last ditch effort to reach the door he ran headlong into Officer Brewster. "Whoa there. Where do you think you're going?" She gripped his bony shoulders to keep him from falling. He flinched and backed away from her, but never raised his eyes from the floor. "Come and meet your room mates." She motioned to the other boys that had gathered around them. Then she introduced each boy by name. "Now I know who you are, but why don't you tell them?" He raised his eyes to hers and she saw fear in them. "It's alright. They're your friends." He looked at the floor and did not speak. He knew they weren't his friends. "Everyone this is John." Officer Brewster placed her hand on his shoulder and gave it a gentle squeeze. "I'm told he likes to be called Johnny." One by one as expected the boys said hello and then returned to their beds to change into their night clothes. "Are you hungry?" His stomach growled in answer. "I'll take that as a yes." She pulled a package from her pocket. "I brought you something to eat. Shall we eat it here or would you like to come with me to the kitchen and find a glass of cold milk?" He turned to the door and waited for her to lead the way. "Lights out in ten minutes." She called to the oldest of her boys. "Yes ma'am." She got in answer. "You heard her," he called to the others, "lights out in ten. You guys had better be in bed by then. And don't forget to brush your teeth." Officer Brewster laughed in earnest at the boy trying to imitate the words she usually spoke to them at bedtime. Cleanliness was next to Godliness and according to Warden Tompkins clean teeth was a big part of a man's cleaning regimen. Johnny followed her down the long hallway staying a few feet behind her and as far as she knew never taking his eyes off his feet. How he ever knew where she walked was a mystery, but he did keep up with her. He also saw many things from beneath the long hair that hung in his face. He saw the monitors outside of the heavy locked doors they passed. He saw several people dressed in uniforms standing guard outside those same doors. He heard locks clicking and the loud noise of many lights going out at once. When she stopped at the kitchen door and opened it for him to enter he was right behind her. "Well come on." She prodded him. He entered. She flipped on the overhead lights, and moved over to the industrial sized refrigerator to get the milk. She hadn't noticed the flinch he made when she flipped the light switch. Johnny stopped in the middle of the room and stood awaiting her instructions. He looked out of the corner of his lowered eyes and scanned the room checking things out. When Officer Brewster turned around to hand him the glass of milk he looked as if he had never moved much less surveyed his surroundings. "Let's sit over here." She pointed to a small table in the corner. Johnny shuffled over and stood by one of the two chairs waiting. When she had sat in the other chair he quietly slid his out and sat down. She placed the milk and sandwiches in front of him and he waited to be told to eat. "Go ahead sweetie." He tore into the food as though he hadn't eaten in weeks. By the looks of the frail boy, maybe he hadn't. Over the next few days Officer Brewster and Johnny would share this special corner of the kitchen as she worked to help the boy gain his strength. He had suffered some pretty severe bruising and cracked ribs from the car crash that killed his parents. Even after a week at the facility he still hadn't spoken a word. Not even at school. Officer Brewster and his teacher at the school the children from the boy's home attended were perplexed at the boy. Medically, there had been no reason for him not to speak, but they all feared that he suffered from some type of mental anguish from the abrupt change in his life. They all hoped the condition would pass, but so far he communicated only with his eyes and in the deep brown orbs they saw loss, fear and sadness well beyond his years. Even though he didn't speak, the other boys had taken a liking to Johnny. He was bright and creative. He could draw animals better than anyone else and helped them with their chores. When the other children at school teased him about being small or about how he looked different, they took up for him. And he did look different. He had long dark hair that hung almost to his shoulders. His cheek bones were very distinct, his nose long and thin and his eyes a deep milk chocolate brown. His skin tone was darker than most. One night when Warden Tompkins let the boys watch television before bed they saw a show about cowboys and Indians. "Are you an Indian?" One of the boys asked him. Johnny simply nodded and then he shook his head no. "Well which is it?" The boy asked. "Yes, or no?" Johnny stared at the boy, but didn't know what to do. How could he explain being both? Officer Brewster answered for him. "He's both." "How can you be both?" The boy asked her. "When one of your parents is of Native American decent and the other is of White decent. Then you are both." That put an end to the questions. None of the boys talked much about their parents. They were all either orphaned or too hard to handle at home so it was not a subject that they often talked about. After that Johnny seemed more relaxed…at least as relaxed as a boy could be under lockdown at a detention center. It was as if he had been accepted. In a small way he had fit in, something that no one realized he had never experienced before. Within a few days Johnny spoke his first words since coming to the center. "Could I have some more milk?" He asked Officer Brewster softly during one of their special late evening snacks in the kitchen. Her head shot up in surprise, but she tried not to react too much. She didn't want to frighten the boy. "Of course you can." She got up slowly, walked over, got the milk from the refrigerator and brought it to the table. Johnny looked up at her and a crooked smile spread across his face, "Thank you." Officer Brewster couldn't contain her joy at Johnny's words. "Oh sweetie! You are so very welcome." She wrapped her arms around the boy and hugged him close. "You can have all the milk you want." Johnny hugged her back. He buried his face against her and let the tears slide down his cheeks; once more remembering how comforting it had been when his mother hugged him that way. From that day forward Johnny talked. He didn't talk a lot and when he did he didn't say much, but he did speak when needed. The other boys carried on as if nothing had changed. Johnny had become one of them in the short time he'd been there. The days passed and turned into weeks and the weeks to months and soon a year had gone by since Johnny was brought to the center. Some of his peers had been placed in foster care or reunited with family, but being older than most families wanted to take in many of the boys were still there, and a few more had come. Johnny had grown taller and filled out a bit, but was still by far one of the smallest boys in the ward. Being small led to being picked on by the bigger boys. One in particular, Davey, loved to make Johnny the brunt of his jokes, and he was full of jokes and pranks. Johnny had learned early on in his stint at the center that going to the officers only resulted in both boys getting detention or extra cleaning chores, so over time he learned to "handle" things on his own. Davey had many ideas up his sleeve, but one of his favorite things to do was to embarrass his prey. He would put dye in their toothpaste that made their lips and teeth turn blue. He would smear toothpaste on their face while they slept, or tie their ankles to their bed making them struggle to get out of it. Johnny had fallen prey to many of the pranks. Having things done while he slept taught him to be a light sleeper. When he threw his arm over his eyes at night it was as much a habit as it was a protective measure allowing him to keep watch over his roommates when they thought he was asleep. It amazed Johnny how the guards had monitors to watch them, but never seemed to notice when pranks were being committed. It was like they had selective vision. One night in particular Johnny lay in his bunk with his arm across his eyes. He had drifted off, but hadn't really gone to sleep when he heard soft voices. Blinking the sleep away he peered out from under his arm and could see shadows moving around the bed beside his. "Keep it down you goofs. We don't want to wake him up." "Hey dufus…pull the blanket down." Davey whispered to one of the other boys. When he felt the blanket on his bed move Johnny bolted up, springing to his feet on top of the mattress and letting out a terrifying warrior cry that sent the boys scrambling away from his bunk in shock. Davey watched as Johnny's eyes darkened into a squint filled with a rage none of the boys had ever seen. His feet were planted in a defensive pose, and he held his hands at the ready to pounce. He continued chanting in a language none of them understood, but that sent fear racing with their blood. To Davey it looked like every muscle in Johnny's body tensed. His eyes darted from person to person. No one moved thinking they would be the receiver of the strange boy's fury. No one wanted to tangle with the crazed Indian. The bolted door clicked, light flooded in from the hall and the night guard moved into the room like a strange shadow until he flipped on the lights. "What's going on in here?" Davey shoved the ropes he held beneath the blanket on his bed and sat down on top. "He just freaked out. He woke me up and scared me to death." The other boys agreed with Davey. Johnny had gotten lost in the moment. Tremors shook is thin frame. He couldn't believe the things that had come out of his mouth. It frightened him that he had lost control like that. He still stood on his bunk lost in a haze of memories flooding his mind. Memories of the lessons he'd had as a young boy in the ways of his people, lessons about being a hunter and a warrior. When he realized that everyone was staring at him he began to shake harder. His stomach cramped and he felt the hot sensation in his throat that comes before getting sick, but he swallowed it back down. He blinked several times. "I…" he looked around the room and to the guards. "I had a bad dream." He sunk down on his bed and lowered his gaze. "It was a nightmare." The guard could see how pale and shaky Johnny was. He also knew from experience the signs of nausea. "Why don't you get some water and get back in bed and the rest of you too. Show's over…back to bed." He turned and left the room turning the lights out before slamming the door. Johnny flinched at the clicking of the bolt. Maybe he did belong in a locked room. The way his emotions had taken control of him must mean he was crazy. Not wanting to draw attention to himself any further he curled into his pillow and pulled the blanket to his chin. "Man you're one crazy half breed. That mixed blood of yours must have made you wacko." Davey sent the verbal jab across the space between their beds. "You better be glad you didn't snitch either." Davey tried to maintain the tough exterior he presented to the others when in fact Johnny's behavior had scared him deeply. That was the last time any night time pranks were played on Johnny. It would also be the last time he allowed his emotions to control his reactions. Officer Brewster watched over her boys with a strong hand, but also with a love like that of their mothers. She worked tirelessly to find the families of her boys in hopes to reunite them and get her boys out of the correctional network and back into private homes. It seemed that the more she looked for Johnny's family the more road blocks she encountered. She had traced his Native American heritage back to a reservation in the next town, but no one would claim what they called the "Half Breed". They wanted nothing to do with the boy. Of course she never told the boys about her efforts unless they led to a happen reunion. It saddened her greatly that such a kind young boy would be shunned in such a cruel manner. Finding no one from that half of his parentage she turned to his father's family. She had tracked them to California. Roderick Gage had been born in Santa Barbara, California to Samuel and Roberta Gage. He had a sister named Rose. Samuel and Roberta were deceased and so that left Rose as his only living relative on record. The information she was able to retrieve about Rose was that she had never married which should make her easier to find since her name would still be Gage. Officer Brewster had taken a trip leaving Warden Tompkins in charge of her boys. When she came back it was with a heavy heart. She had not been able to locate Rose Gage, and now thought that Johnny would have to spend the rest of his teenage years at the center. The prospect saddened her. The year he had already been there changed him. The once bright twelve year old had become an angry almost fourteen year old whose grades had dropped and who spoke less and less. His eyes had become dark and lifeless. He no longer met her for their special snack time and hadn't for months now. Johnny had always been a good student. He generally brought A's on his report cards, but they had started falling for several months now. The teachers said he had stopped participating in class and often daydreamed instead of paying attention. "He sits and stares out the window. When I call on him it's as though he wasn't even in the room during our discussions. He doesn't turn in his homework and lately I don't even see him carrying his books." His teacher had said when Officer Brewster called to discuss several of her boy's grades. "Ever since that misunderstanding a few months ago it's as if he has just given up." "Well being accused of destruction of school property when you were innocent but no one would listen to you because they thought since you came from a Juvenile Detention Home that you must deserve to be there just might bring on some distraction." Officer Brewster had told the teacher. "Yes it was unfortunate that he was punished for that when he hadn't done it after all, but you have to understand our standpoint. We believed the child that lied. He comes from a good home with two very successful parents. We had no idea that he was the child that had painted those horrible words on the gym walls. If we had known Johnny would never have been made to stay after school and repaint the gym." The teacher tried to make excuses, but they fell on unsympathetic ears. "He tried to tell you." "Yes, yes he did, but you see our position." "No I fail to see how you could take one student's word over another when he has never given you reason to doubt him. When he has never done anything, but come to class and perform with excellent ability and good marks. No…I don't see, and I never will. Some of the boys at our facility are there as a result of their upbringing, some from bad choices and at least one, because of his heritage. None of my boys deserve any less than the best we can give them to try to help them become responsible law abiding adults. Now, with that in mind, what do you plan to do to try to help Johnny bring his grades back up?" Officer Brewster held the receiver to her ear and waited for the teacher to respond. She knew she was still on the line…she could hear her breathing. "Maybe if I talk to the boy?" "The boy's name is Johnny." "Yes Officer Brewster, I know his name. I'll talk to him; see if I can get him to pay attention in class. Um…"
"Is there some extra credit work that might help him bring up his grade?" But the extra credit never came, and Johnny became more withdrawn. He spent more and more time alone. She often found him outside in gated courtyard. While the others watched television, he would slip out there and stare up at the stars. Johnny was slipping into his own world, and she didn't know how to draw him out again. Her despair turned to hope again when she received some information about Rose Gage. Johnny's aunt had been traveling overseas in Europe and had not received word of her brother's death. She had seen Johnny as a baby, but of course he had no memory of that. She had sent word to Officer Brewster that she would be returning to the states sometime next month and would make arrangements to come see the boy. She hoped that Rose would want to take Johnny with her to California, but a single woman trying to raise an angry teenage boy she had only met as a baby would be difficult if not impossible, so she prayed hard about it. If there was any hope for things to work out for Johnny, God would have to have a hand in it. The thing that most worried her was that Rose Gage had gotten married in Europe. Now the newlyweds were coming home to tragedy and a nephew who needed them. Would they be willing to take on that responsibility? Things did not go as planned. Rose and her husband did not come back so soon. He fell ill and they had to stay in Europe. It would be months before they made it back to California let alone to meet their nephew. Johnny ended up getting farmed out to several foster homes in the next few months. Johnny had already experienced foster care at its worst before being sent to the juvenile detention center. Immediately after his parent's deaths he had been sent to live with a family on the reservation. His father had been good at ranching and even though Johnny had been a bit small for his age had allowed him to being learning the trade. Johnny had learned to rope calves, muck stalls and groom and care for the animals. He was a natural with them. His father had said the animals could sense his kind nature. His foster parents had hoped to take on the child to work their ranch, but the boy had been so grief stricken and afraid that he lacked any desire to participate in their plan. "I said get up and muck that stall!" His foster father yelled at him with his fists balled and his face flaring red. Johnny remained still; staring through the man as though he wasn't there. The blank stare enraged the man. "Get up!" Johnny felt the rough grip on his thin arms; he felt himself pulled to his feet and the first blow across his face stung, but he didn't care. This was not his home. This was not his father. These were not his animals. His animals had been sold to the highest bidder; his home emptied and the proceeds dispersed according to the tribal leader's wishes. Johnny had nothing. He didn't care that the smelly man shoved him against the stall trying to get him to take the pitchfork. He didn't care that his lip continued to bleed dripping onto his worn shirt. The next thing he knew his things had been packed and dropped beside him where he lay on the barn floor. No tears fell from his eyes. No noise slipped from his bleeding lips. "Get out you worthless piece of trash." His foster mother had spat at him. "We should have known you were just a useless half breed." Somehow Johnny managed to find his way to the ranch that had been his family home. Not knowing what else to do and having nowhere to go he hid in the barn. Several days passed before the new owner's found him passed out in the hay loft. When he awoke again he was back at the clinic where the doctors and nurses preferred to keep him in the fog he hated so desperately. Next he had been placed with another couple who lived in the town near the reservation, a white couple. It turned out they only took him in to show that they were good people who didn't hold prejudice against Indians. Johnny hadn't stayed there long before the real reason he had been taken in by this couple was that the man was a feed dealer and only wanted to gain favor with the ranch owners on the reservation so they would buy from him. Johnny remembered listening from his room as his foster mother yelled at her husband about having to take care of the little savage. "They aren't even buying feed from us. Why do I have to keep working my fingers to the bone washing his clothes and feeding the little waif! He doesn't' even talk. That little savage doesn't even appreciate what we have done for him!" "If we don't do something we'll lose the feed store!" Her husband yelled back. "The ranches on the reservation are the most successful in the county. I need their business!" "Well you aren't getting it anyway. Send him away! I won't take care of him any longer!" Johnny put his hands over his ears and let the quiet tears slip from his eyes. He missed his parents and just wanted to be left alone. The next morning he had been sent to the home for troubled kids. That was the only place that would accept 'his kind'. History seemed to be repeating itself with the families Johnny was tossed to and from. Most of the families didn't know what to do with the quiet boy. He didn't mix well with their other children and seemed to get into more trouble at school. No one ever took the time to ask him why he got in trouble. No one took the time to find out that he had been taunted relentlessly by the other students and some of the teachers for his Native American heritage. No one asked him about the nightmares that woke him in the middle of the night screaming. They just sent him back to the center and to Officer Brewster who always welcomed him with open arms. The boy was quickly becoming a young man. The last family had kept Johnny the longest, but in the end Johnny had fled. The man had hit him in the face one time too many when Johnny refused his secret advances. They had been 'cleaning the garage' when the man had sidled up behind him and began rubbing his shoulders. He had touched Johnny like that before, but the wife had come into the room stopping the man's advances. Johnny knew the man's behavior was wrong and had been able to keep his distance until that morning when his foster mother told him that 'her men' would be cleaning the garage today. "Right after breakfast you two will be cleaning out the garage. I'm planning a yard sale next weekend. I just know there are some things out there that we can sell." She smiled at them as she dished out scrambled eggs on their plates. "That's why I have prepared my men this big breakfast. You really have your work cut out for you." "We'll do a great job for you sweetie." Johnny's foster dad looked at him when he spoke instead of at his wife. "Won't we son?" Johnny didn't respond. He simply picked up his fork and started eating the eggs. He usually had cold cereal while his foster parents enjoyed eggs and bacon or pancakes. They had told him it was too expensive to feed him that kind of food every day. Johnny dreaded going out to the garage alone with his foster father. He wouldn't be able to get far away from the man. But when he felt the hands on his shoulders and hot breath close to his neck he had jerked away. Before he could get far enough from the man's reach he had been spun around and saw stars when the large fist contacted with his eye. He stumbled, but was able to regain his footing and fled into the house. He ran to the room where he slept and grabbed for his things throwing them on the blanket from the bed and balling them into a bundle. He raised the window, pushed out the screen and climbed out. He didn't know where to go. His eye hurt and had begun to swell. He started out running with no real direction…just away. He ran and ran until he couldn't run any further, and then he walked. For hours he walked and walked. It was getting dark outside when he finally decided he was far enough away. By that time he was outside of town near the reservation that had once been his home. He didn't want anything to do with that place either, so he found a spot beneath an old wooden bridge and settled in for the night. It was fall and quite cold at night. Johnny didn't know that rain had been forecast for the night. He didn't know that before morning he would be soaked to the bone. When the first drops of rain began seeping through the boards above his head and hitting his cheek he had simply pulled the blanket over his head. He had used his clothes as a pillow. After a few moments the trickle became a deluge and not only was the blanket soaked, but his clothes were too. He felt the cold against his damp skin and decided that he needed to move. Johnny quickly bundled up his things and set out again. Not knowing where else to go, he decided he would go to Officer Brewster for help. The detention center had felt more like home to him than the several foster places he had been since being sent away from there. Maybe they would let him come back. Several days later and several very cold nights found Johnny at the front gate. He knew from experience that the boys would be leaving for school shortly by the angle of the sun, so he slipped into the trees across the street to wait for the gate to open. Exhausted from the past few days' travel, Johnny fell asleep on the damp ground beneath the trees. When he awoke the sun was high in the afternoon sky. Johnny slowly got to his feet and made his way across the road. He slipped through the gate that was usually open during the day and toward the main entrance. It had been several months since he had been there, but everything looked the same. Johnny made his way down the corridor with the heavy doors, monitors and adjoining speakers to the one he had been assigned to during his stay. The door stood open because the boys were at school. Johnny walked over to the bed that had been his wanting to simply crawl into it as he had when he had first been brought to the facility, but he thought the bed might belong to another boy now. He turned toward the heavily curtained window and padded between the row of beds and footlockers to the window. Then he turned to the corner where he laid out his dusty, road weary blanket, stacked his clothes to rest his head on and eased himself down for a rest. The swelling on his eye had gone down some, but he still winced at the ache that he seemed to feel every time he closed it. He hadn't bothered to find a mirror in the past several days to look at it. He knew it must be bruised and colorful. Johnny could feel the cool wooden floor beneath the blanket, but a warmth and comfort seemed to fill his heart as he felt safe for the first time in a long time. Officer Brewster sat in her office enjoying an afternoon cup of coffee enjoying the quiet before the boys got back from school. When she heard a knock at the door, she almost pretended not to be there. This was one of the few pleasures she allowed herself while the boys were away from the facility. But she knew no one would disturb her unless it was important. "Yes, come in." The door opened slowly and one of the guards peeked in. "Sorry to disturb you, but there is something I need you to see." Officer Brewster took one last sip of the warm brew and rose from her desk chair. "What is it?" "I think one of your boys has decided to skip school today." "One of my boys? I don't think so, I watched them all file out the gate this morning. Why do you think it's one of mine?" She said as the two walked down the corridor toward the wards. "I saw him on the monitor in your ward. For some strange reason he curled up in the corner on the floor." "He what? He'll catch his death of cold!" She quickened her pace. "Who is it?" "I'm not sure; I didn't see him when he came in. I was on lunch." "You weren't watching the monitors?" She glared at the man. "No ma'am, we aren't required to stay at the monitoring station when all the boys are out of the facility. If one is sick or for whatever reason stays home from school then we do, but no one was supposed to be here today." He explained. "Oh, that makes sense, I guess." They had made it to her ward. She walked softly between the beds not wanting to frighten the boy. What she found when she knelt down beside the covered boy surprised her. It was Johnny, and he looked terrible. "Johnny?" She gently shook his shoulder. "Wake up sweetie." Officer Brewster couldn't see the black eye, but she could see how dirty he was. "Johnny?" She shook him again. When he finally stirred Officer Brewster gasped when she saw his fever bright cheeks and the dark purple around his eye. "Oh, Johnny! What happened to you?" His answer came in a deep racking cough that left him breathless. He didn't answer. Instead he closed his eyes and laid his head back down on the pile of clothes. All he wanted to do was sleep until he felt better. "Help me get him to his bed." Officer Brewster looked to the guard as she moved around to slide her hands beneath Johnny's arms. "The one he's always had. There's no one assigned to it. They kept sending him back." They struggled over to the bunk. "Just put him on top of the blanket for now. We need to clean him up and then we'll change the bedding." She smoothed the damp hair from Johnny's face and felt the warmth coming off his skin. "Maybe we need to call the doctor." "Do you want me to go do that?" "No you stay with him. I'll call after we get him cleaned up." She turned to go get a bowl of warm water and towels. The guard looked down on the sleeping teen. 'What kind of trouble have you gotten into now?' He automatically believed that Johnny had been a ward of the state due to some horrible wrong he had committed and not simply because he was unwanted even by other agencies set up to protect orphaned children, because of his being half Native American. Officer Brewster returned quickly and placed the wash basin on the foot locker. "Help me get him out of these filthy things." She moved beside the bed and lifted Johnny's sleeping form from the pillow. The guard helped her pull his shirt off only to reveal how much weight Johnny had lost. His ribs were prominently sticking out and his shoulders looked bony. "Oh, you poor baby, haven't they been feeding you?" "Man he's about the skinniest kid I've ever seen." The guard remarked. "He was always skinny, but this is the worst I've seen. Now let's get his shoes and pants." She continued her ministrations to get Johnny more comfortable. With the guard's assistance they finally had Johnny undressed, bathed, at least the best they could with a bed bath, and dressed in a t-shirt and shorts. Then they had rolled him this way and that until they had the bed freshened as well. The exhausted teen never woke, but the two caregivers had felt the heat emanating from his skin. They knew his fever was high. They also knew where he had been and how far the journey was to get back to the center. They knew it must have taken him several days to walk it and at least two cold nights one of which had been very wet and cold. "It's no wonder he's sick." Officer Brewster said as she finished tucking the extra blanket around the youth. "So, what's his story?" The guard wondered aloud. Not realizing he had spoken aloud the man almost jumped when she asked. "I mean what did he do to get sent here to begin with? And why on earth would he come back on his own will?" The guard scratched his ear as he spoke. "Nothing…he didn't do anything except be born." She said sadly. "Born of parents from two cultures neither of which was very accepting." "You mean he didn't get sentenced here by the court?" Astonishment shone on the guard's face. "No he didn't. His parents were killed in an auto accident and Johnny had nowhere to go. We found an aunt that would have taken him, but she's in Europe with her sick husband and can't get back here. We hoped by placing him in foster care that he would have a better life, but I guess we were wrong. He must have come back here, because this is the only place he knew to come." "Man." He ran his hand through his hair. "That's a shame…poor guy. He doesn't look weird like some mixed race people. What is he anyway?" "He's half white and half Native American." Officer Brewster stood watching the guard's reaction. When he didn't seem bothered by Johnny's heritage she continued talking. "His parent's took him to live on the reservation. They owned a ranch and had gone into town one day. On the way back they were hit by a large truck. His mother died at impact, but his father lingered at the hospital for several days. Johnny hadn't been seriously injured, but was very traumatized, as anyone would be under the circumstances. When the doctors had kept him sedated as long as they could and he had no medical reason to be in the hospital they tried to send him back to the reservation, but no one would take the boy in. He was only twelve at the time. The children's home refused to take him too stating that he was unacceptable. We were the only option left for him. He was just a scared little boy, a scared little boy that lost the opportunity to be a normal boy; lost when his parents died, but really lost at conception. He's never been able to just be a kid." The guard discretely wiped moisture from his eyes and turned to leave the room. He hadn't ever heard such a sad tale, and didn't want Officer Brewster to see how emotional it had made him. "I'd better get ready for the others. They should be back from school pretty soon." He stopped and turned back. "Should I tell them not to come in here? Maybe send them to the common room." "That would be a good idea, at least until the doctor comes to check him out. I'm afraid he may have pneumonia. My mother used to get it every year. There's no mistaking the wheezing. I'll be surprised if he doesn't have it." "Yeah, my brother used to get it too. Once you've had it you tend to get it more easily. I'll just meet the others at the door." Johnny did have pneumonia and a possible cracked cheek bone, but without x-ray's the doctor couldn't be sure. Since he was already settled and Officer Brewster had some medical training it was decided that Johnny could stay put rather than taking him to the hospital. But he was given oral antibiotics and instructions to be brought to the hospital if he worsened at all. Finally, after several months and almost three full years after he had lost his parents, Rose Gage Watson came for her nephew. Johnny clung to Officer Brewster, his hand holding hers. His experiences with foster care had left him wary of anyone. He didn't know these people who had come claiming to be his family. Sure the woman looked like his father, but three years had made his father's face fade from his memory. She could be anyone. Why would they send him all the way to California? Had he been that bad? Had he caused that much trouble? He pleaded with Officer Brewster and Warden Tompkins not to send him away, but in the end he stood, packed and ready and waiting by the door as his aunt and uncle said their goodbyes to Officer Brewster and Ward the detention center staff. Johnny turned his back on them and planned to never look back. He felt the same contempt for them as he had for the doctors and nurses who had continually plunged him into darkness with their sedatives as his father lay dying. His mother had died in the crash, but his father had lingered at the hospital and Johnny had watched him slip away. Now he was being uprooted again and sent away to a foreign place with people he didn't even know. He had slipped into silence again. Officer Brewster felt a great deal of heartache over sending him away after he'd begged to stay, but she knew this was the best thing for the young man. Someday he would know it too. Someday he would thank her for it…she hoped. "Goodbye Johnny." She pulled him into an embrace. He leaned his head against her shoulder, but didn't hug her back. Silent tears slid down his cheeks.